Launch in just 20 secs. IDCF Cloud pursues the best cost performance with high quality. You can swiftly increase or decrease CPU or memory at anytime, anywhere. You can also scale or change configuration of servers at will. Its HA function makes IDCF Cloud a reliable public IaaS cloud. IDCF Cloud is an ultra high-speed cloud that adopts All-Flash in all region and zones! High performance servers using flash memory drives for the storage system are available with all virtual machine types. *1 The comparison is made between configurations with a hard disk drive (which also uses flash memory drives in combination) and with a flash memory drive only, both of which are available on IDCF Cloud. *2 The research and comparison is made among the major Japanese domestic IaaS providers by IDC Frontier. The entry form is simple. Just enter your email address and a few more items, and you are ready to use IDCF Cloud. Scale 100 VMs in 3 mins. Just choose your desired specs on control panel.1 VM launch in 20 secs, 100 VM parallel launch in 3 mins (2 secs per server). See how much you can do with IDCF Cloud's Ultra-Fast VMs! *4 It is based on the results of the random write test in a situation with highly loaded processes conducted by IDC Frontier. by Minimum Numbers of VMs. No more old-fashioned scale-out just by adding VMs forever.Experience cost-effective scale-out by IDCF Cloud's high performance VMs with minimum numbers of VMs. IDCF Cloud offers 5 types of specs for VM.Rich line up of VM and optional menu supporting every scenes and stages of your business, ranging from "Light" plan suitable for start-ups, to high spec plans like HighIO/HighSTR of 40-core, 128BG memory, etc. No more worry for your heavy duty web site spiky accesses and/or database requires super-fast I/O procession.IDCF Cloud's HighIO/HighSTR enables them stress-free environments. Your server resources are NOT shared with other cloud users enabling overwhelming procession performance and stability. High procession performance is supported by Fusion-io's ioMemory PX(R), which gives you better performance than that of ioDrive2(R). Manage Easy. Multiple VMs on "Mackerel(R)"
"Mackerel"is a cloud performance management tool in the spotlight, which lets you monitor servers with graphs illustrated by roles and superposed. Makerel is suitable for cloud resource monitoring, as it allows you to grasp the state of resources or operation in the multiple server management. It is an open tool which supports on-premises or multi-cloud, which is the very reason it allows you to accelerate load reduction and efficiency of administrative processes. IDCF Users can use Mackerel with no monthly fee, and no limitation with the number of servers being monitored. Graphs display data of the latest week. Up to 200 hosts, 5 services, and 10 monitoring metrics are available per server. No initial charge. From 500yen per month. 1yen per hour, 500yen per month.*. Easy budgeting. No more worry for unexpected charges on your bills.Pay small when only using little, but no unlimited charging even when using a lot. Price List The prices displayed do not include tax. The IDCF Cloud's basic service consists of a virtual machine, za volume, and a network (free of charge up to 3,240 GB per month), for each of which you will be charged. * Each of the virtual machine prices does not include disks. Please refer to the Volume section for disk prices. * A HighIOcomes with a volume. * Each virtual machine type comes with a different CPU clock. * A HighIO/HighSTR comes with a volume. * The root disk capacity is 15 GB for the standard template. For a paid template, 80 GB for Windows OS. * A data disk is suitable for operations which require high performance such as databases. * Volume is offered with the same price in both West and East Japan Regions. * The network utility rate is applied to the outgoing traffic, which is transferred from IDCF Cloud. No charge for the incoming traffic. * A free usage quota is applied to the total amount of all the pay-per-use network traffics. For multiple zone users, the quota is applied for each zone. 3 easy steps to build an infrastructure! No need for cold standby. 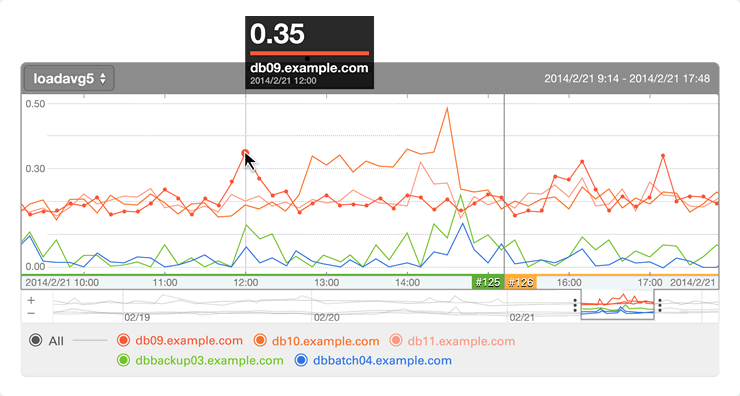 High DB performance to process enormous accesses.